We will not hide things we have heard and known, stories our ancestors have told. so that they will set their hope in God and obey God’s commands. Great God, we exalt and worship you. In Christ you offer us everything we need. and there may we discover the table of forgiveness and healing, of laughter and joy. 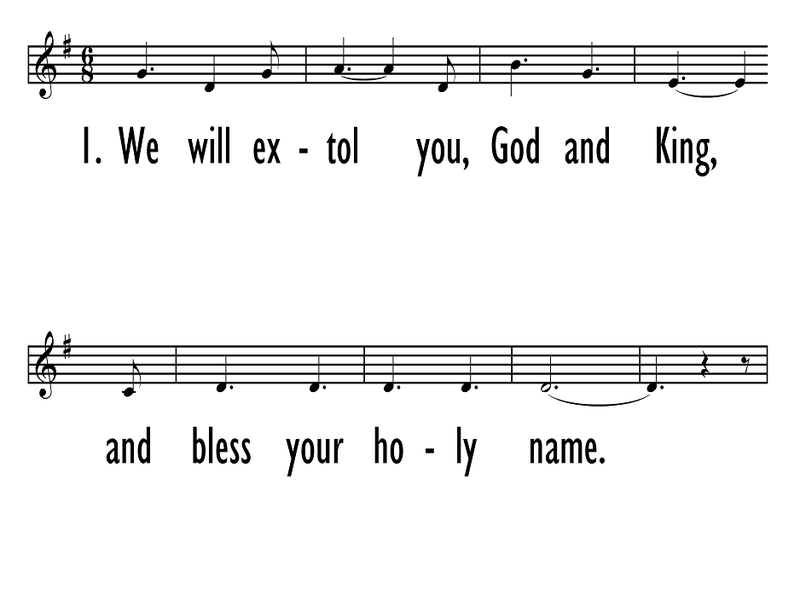 This setting of Psalm 145:1-7 was one of the winning songs of the Christian Reformed Church’s sesqucentennial hymn contest in 2007 and was published as “One Generation Will Call to the Next” in 2008 in Contemporary Songs for Worship. It was also included and identified by the first line “We Will Extol You, God and King” in Psalms for All Seasons (2012), and in the collection Lift Up Your Hearts (2013). Greg Scheer (b. 1966) has composed hundreds of pieces, songs and arrangements. His music is published by Augsburg Fortress, GIA, Abingdon Press, Worship Today, Faith Alive and in numerous hymnals. He has won commissions from the Iowa Choral Directors Association, Iowa Composers Forum, Linn-Mar High School String Orchestra, Chagall String Quartet and Northwestern College. His electronic piece, "Crossfade," was included on the CD ...from everlasting to everlasting... His string quartet "6" was featured on WQED in Pittsburgh and was also a winning composition in the 2000 Southeastern Composers' Symposium. His hymn "People of the Lord" won the Calvin09 hymn contest and was subsequently sung and published internationally.